Outlook 2016 creates a new road-map for enthusiast users on Windows and Mac platform. Experts are believed that Outlook 2016 Mac is a boon for Office lovers under Macintosh environment while Outlook 2016 Windows provides richer and higher experience with email and calendar. Of Course! Both email clients are developed by Microsoft Inc. but features depend on the platforms like Mac or Windows. To explore even a little bit difference between Windows and Mac version of Outlook 2016, this guide is dedicated to revealing the presence or absence of all features in a comparative format. 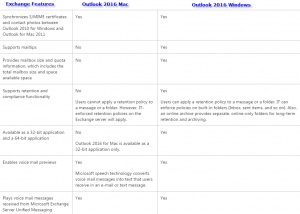 Mac based Outlook 2016 is a big milestone which is delivered by ‘Microsoft Developer Team’ to end users of Macintosh. It is based on the concept of mapping versatile GUI (graphical user interface) of Windows Outlook under Macintosh environment. For storing emails at the local system, Outlook data file (.PST) is playing bigger role as a centralized database system. With this one facility, Outlook user can access their email items while disabled with internet. Under a single Outlook folder, you can initiate a conversation just like a thread on Mac as well as Windows operating system with Outlook 2016. Sometimes, we need to integrate multiple email accounts in as single Outlook ‘Inbox’. With this kind of need, both email clients have the potential to link multiple amounts through single mailbox. You can do this one operation with both email applications. Apart from the support of handing multiple email accounts from a single mailbox, Outlook 2016 (Mac/Windows) comes with highly advanced algorithm for searching contacts which are stored in Outlook data base files/ Outlook Address book. In Outlook 2016 Mac, you can’t create table but alternative is available through copying tables from Word into Outlook. However, table creation is completely supported by Windows version. Users of both versions have the option to check email attachments in preview mode. Along with the preview, it shows photo of corresponding contacts in emails, contact list and calendar. It is fully applied to Mac and Windows version. Outlook 2016 Mac is showing calendar with option to enable week numbers along day and week view, but not compatible with the mini calendars or month layout. While, Windows Outlook 2016 is supporting to display week numbers along navigation of calendar like day, week and month. OAB Access: OAB is known as Offline address book which is compatible to access with Windows and Mac environment. It provides option to create modifiers at server side to manage account in customize mode. Outlook 2016 Mac is unable to manage ‘Exchange server distribution lists’ while Windows version is doing this task smoothly & efficiently. Personal distribution list is not synchronized by Windows or Mac edition. Outlook 2016 Mac is fully capable to synchronize categories with Outlook for Windows as well as master category list while it is not available with Windows Outlook 2016. These email applications have feature to synchronize with emails, tasks, notes, contacts and calendars with exchange server. Web based popular email client Gmail is fully supported by these local email client. You can synchronize folders of Gmail account with Outlook 2016 Mac or Windows. It supports ‘Lync presence information’ as well as creation of online Lynch meeting. These email clients are compatible with online archive. 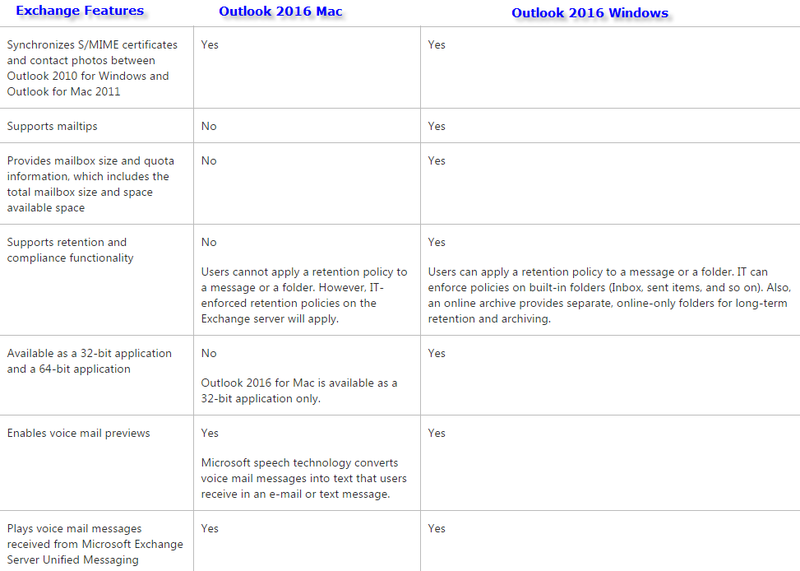 Both email application supports ‘Information Rights Management policies’ but Outlook 2016 Mac is comparatively advanced than the Windows version. It supports Active directory as well as Microsoft Azure based information managements. As per requirement, Outlook 2016 is fully versatile for Mac and Windows System. It covers each aspect of business framework from small entity to large corporate groups.